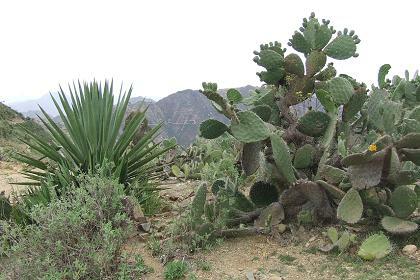 From and Eritrean friend in the United States, I received five detailed suggestions for hikes. Today I will do the first one with Gebrehiwot, who is happy to accompany me. And he has a car, so it is a piece of cake to find the starting point. 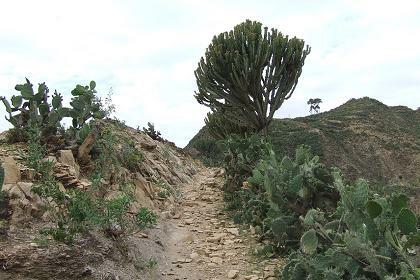 But Gebrehiwot has a more practical view on this hike and adds another three kilometers to the suggested one with some fatiguing shortcuts from Biet Georgis to Durfo after parking his car at the checkpoint. The weather is perfect for me and my poor health: it is clouded and there is a cool breeze. At Durfo we start to follow the trail from Shegerni to Argolo. Most of the path is smooth and horizontal. 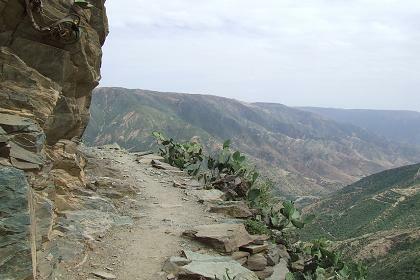 Some parts are covered with rocks, reminding me of the trail to Debre Bizen. The views are spectacular, but being afraid of heights, I concentrate on the path right in front of me most of the time, taking two minutes rest for some water and an overview at the most beautiful sights. Gebrehiwot is clearly the more experienced walker, at ease in this rough terrain, and when another Eritrean man joins our small group it is even harder to keep up with them in this 2400 meter high thin air. In three and a half hour we finish the round trip Biet Georgis - Durfo - Shegerni - Argolo and back. 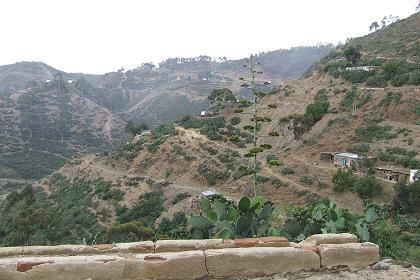 Back in Asmara I take some rest, to spend the rest of the day on the terraces of Harnet Avenue. At the market I buy two bottles of araki for Gebrehiwot. He will not accept my money, but araki is a gift that is always welcomed. 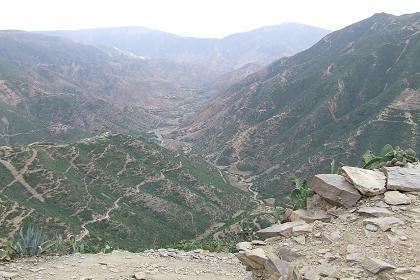 View from the road to Massawa. Bar Durfo - start of the trail to Argolo. 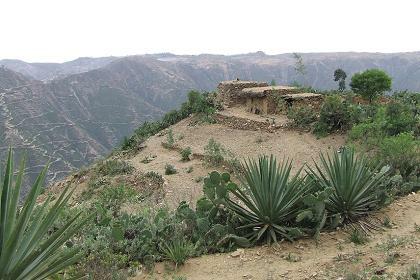 View from the trail to Argolo - Shegerni Eritrea. 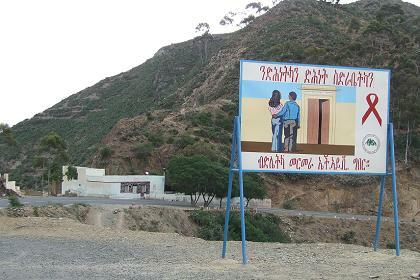 Traditional houses - Argolo Eritrea. The trail from Argolo to Shegerni. 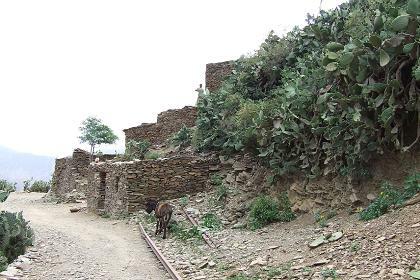 Traditional houses - Shegerni Eritrea. 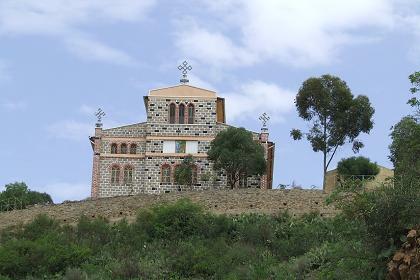 Abune Argawi Orthodox Church - Asmara Massawa road. Announcement of the Miss Intercontinental election.